KANAN�s admirers range from Bade Ghulam Ali Khan, Ravi Shankar, Nikhil Banerjee and Begum Akhtar to Kanika Banerjee, Suchitra Mitra Shantideb Ghosh.Among her admirers also were Devika Rani, Mukesh, Lata Mangeshkar and Hirabai Barodekar- not to speak of the millions spread out all over the country. Her training in music was from Ustad Allah Rakha and from Rai Chand Boral, Pankaj Kumar Mallick. 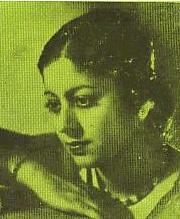 She was also trained by Dhirendra Chandra Mitra, Anadi Dastidar and Bhishmadeb Chatterjee. d) Kaun Man Lubhaya Kaise Man Mein aya.